Central Tech and Cleveland Public Schools have partnered together to offer a selection of classes to be held at the High School. Enrollment information and class schedule are listed below. We are very fortunate to be able to offer so many learning opportunities and experiences for our students. In the 12 days leading up to Christmas break, we would like to take time to remember our blessings and countdown just some of the opportunities students, families, staff and the community have by being a part of CPS. It’s seems odd to discuss storm shelters at Christmas but the number one priority of Cleveland Public Schools is to keep our students as safe and secure as possible. This encompasses many different issues but one of our greatest fears in Oklahoma is the threat of severe weather. There is nothing more stressful for a parent than worrying if there child is safe when tornadoes are approaching. Fortunately, we have the ability to protect our staff and students when bad weather approaches. We are one of the few districts that have a storm shelter available in every building in our district. While many districts feel fortunate if they have a single storm shelter for their district, CPS has six! We love to brag there isn’t a time students and staff are not in close proximity to a storm shelter while they are on campus. We are very blessed to have this luxury and be able offer our stakeholders a piece of mind. The inside of view of the new Primary School Storm shelter recently completed. One of our first shelters built is located in our Event Center. This site gives us the ability to protect our citizens if a storm to pops up while we are hosting an event. With our most recent bond issue, we were able to construct an additional storm shelter at the Primary School site to accommodate our growing pre-school program for four year old children. CPS has a partnership with the City of Cleveland to make this site available to the community this spring during non school hours if the need arises. Not only do we make every effort to protect our staff and students, we also feel it is our duty to provide safety to our community. We thank our citizens for making CPS a safe and secure place for our children to go to school, even during the most hazardous of times. Current CPS students taking advantage of the Cleveland Personal Academic Center. program. Cleveland Personal Academic Center (CPAC) is a virtual learning environment where students use technology to access self-paced instruction. This type of environment allows students to have a flexible schedule that fits their individual needs. CPAC is open from 7am to 4pm, which is longer than the traditional building, allowing these students the ability to adapt their school schedule to fit with work schedules or other outside conflicts. This gives a student needing to take college course work in the morning, or to attend work in the afternoon the ability to do so. This also gives students the ability to attend for the required 6 ½ hours school day to stay on track for ontime graduation. CPAC uses an accredited computer program which is the same type of offering that online schools use. The difference is CPAC offers full and part time certified teachers to serve as mentors and tutors who are available in person to help our students. We have found this model has met the needs of our virtual learners and still allows for the guidance of great teachers. This program is a choice we offer to students as an alternative to going to a complete virtual environment. Our program has grown from 30 students initially to over 70 students now in a little over a year and it’s proving to be very successful in providing flexibility and a rigorous academic program. By being self-paced, it has led to many students finishing their high school requirements ahead of schedule so they can begin their next stage of their academic life early as well as allowed students to catch up and graduate on time if they had a few missteps early in their high school career. 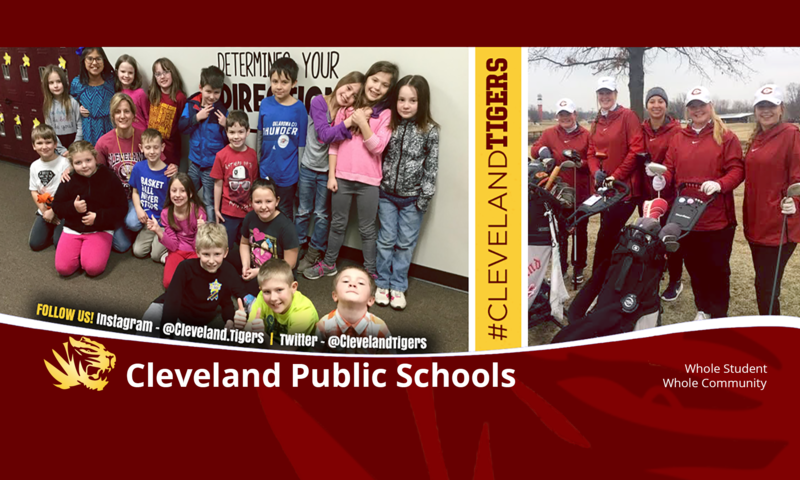 Cleveland Public Schools is proud to offer such a quality program that meets the needs of our students. Student leader Chelsey Hughes presented a proposal to the Board of Education during their regular monthly meeting for the District to replace several of the drinking fountains in the High School with new, “water filling stations” in an effort to help improve the school’s environmental impact by reducing the number of plastic bottles destined for landfills. The system Ms. Hughes advocated for would allow students and staff to refill any type of personal sized water bottle, which would reduce the number of single use containers being placed into the trash. “It is a fact that plastic water bottles can take between 400 and 1,000 years to decompose. By purchasing water bottles on the daily we are not only hurting our pockets but also the environment” she said in her written statement she presented. Additionally, she stated, “In the last couple of years Cleveland has been through many upgrades to make the school a brighter and friendlier place. Upgrading the water fountains would just add to that new and improved look”. Dr. Espolt commended her for taking the initiative to make Cleveland a better place and being a part of the solution. Through the board’s approval of the consent agenda, the money was approved to purchase the new water fountains and we look forward to the improved offerings very soon. Cleveland Public School is once again offering flu vaccination for students and parents to help improve the chances of avoiding a large number of flu cases this year. If you would like for your student, to receive the flu shot, or one of the others listed, please download and complete the appropriate forms. Forms can be returned to the school any time prior to the time the students are scheduled to have an opportunity to get the shot. Participation in this program is voluntary. We will be providing food services for breakfast and lunch this summer! Kids 18 and younger eat free and do not have to be enrolled at CPS. Due to the significant amount of teachers who were planning on being out tomorrow, and with no end in sight of the lobbying efforts at the capital, Cleveland Public Schools is enacting the original plan to be out through Wednesday, April 4th. This plan was board approved during a special board meeting on March, 26th. All extra-curricular activities will take place. The ACT Test for Juniors and any other registered student will still be offered at the Event Center. Report to the High School by 8:15. Be sure to bring a NO. 2 pencil and an approved model of calculator! NOTE 1: We do have some calculators available to use during the test. But if you have one available that meets the requirements and you are familiar with its operations then you should bring it. NOTE 2: If you can not make this test date you WILL be able to take it on the make up day, April 24th. This is, however, the only other date to take the test and as a reminder, taking this test is a requirement as it is a part of state testing. The district sincerely regrets the inconvenience this has caused our stakeholders and apologizes for the hardships that are a result. Late Thursday Afternoon, March 29, 2018, Governor Fallin signed House Bill 1010XX into law. Because this first step toward improving the financial situation of Oklahoma education and its’ employees have been passed, Cleveland Public Schools will be in session April 2nd, 3rd, and 4th as regularly scheduled. CPS would like to thank the Oklahoma State Legislature for supporting this initial step toward improving education funding. We are extremely encouraged by this show of support and understand that there is still much work to be done to restore funding levels. CPS would also like to thank our community for their support, our teachers and staff for their dedication during this time, and our students for always staying focused on their future. Press release from the Governor. On March 26th, 2018 the Board of Education voted unanimously to suspend school on April 2nd, 3rd, and 4th to support teachers and students in supporting a call to increase funding for Oklahoma education. We assure you this decision was not made hastily, only after extensive review by the board. There is a link to the presentation exhibited to the board by Superintendent Aaron Espolt at the bottom of this post containing information regarding education funding at the state and local level. During this same evening, the Oklahoma House of Representatives passed revenue bill 79-19. From the press information being released (CCOSA and OSSBA), it will give an average $6,000 teacher raise, over $1,200 support staff raise, and operational expenses. This can always change as it goes through the political process, but this is what we know as of now. The bills will next be heard in the Oklahoma Senate as the Legislators push to get it done before April 2nd. If the bills related to school funding pass and the Governor signs the legislation prior to March 30th, 2018, we will not suspend school in April and we will follow the school calendar as it is now. If these funding bills do not pass, we will suspend school starting on April 2nd through April 4th. It will be a three-day suspension. After the three days, there will be a rolling delegation of staff allowed to go to the capital on behalf of the district to promote increased funding for Oklahoma education. These three days off will need to be made up. To do this, we will use the two remaining snow days from the school calendar scheduled for April 13th and 27th which will extend the year to go to school on Friday, May 11th. This will still conclude school prior to graduation on Saturday, May 12th. 1) We will still provide child nutrition services for all students at the Middle School during the suspension. Breakfast will still be offered from 7:30 to 9:00 AM and Lunch will be available from 11:00 AM to 1:00 PM. 2) We will still hold to the schedule for extra-curricular activities. Practice times could be impacted. Coaches and Sponsors will let students know directly of those changes. 3) The ACT test will still be offered to all Juniors and Seniors who are interested on April 3rd. Breakfast and Lunch will be available at the High School for test takers. We are making one change regardless of if we are out or not for these three days. PreK and Kindergarten enrollment will be on Thursday, April 5th and 6th, as well as April 9th and 10th from 9:00 AM – 2:00 PM At the Primary School. More information will follow as the need arises. Class will be back in session January 17th, 2018! We do ask, if you have a student who is experiencing flu-like symptoms, that you keep them home and contact their school. For More information, please visit the CDC website concerning the flu.